It's the Cucalorus Oscar Ballot! 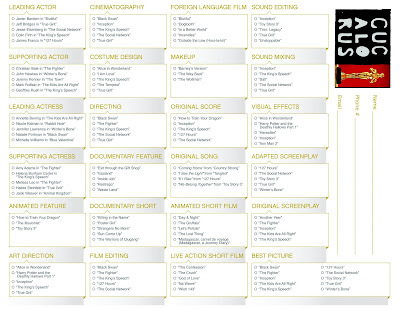 Think you know who will win for Best Picture? How about Leading Actress? Test your telepathic tendencies by filling out our Oscar ballot. Over 20 categories for you and your friends to take a stab at. See how many you can answer correctly. Scoop up your ballots at the event or print from home. It's easy, fun and a great way to show love for Cucalorus. Click Here for printable ballot! Join Cucalorus, your favorite film festival, as they put on their second annual Oscar Party fundraiser at the Hilton Wilmington Riverside on Sunday, February 27th at 7:30pm! We'll be enjoying the Academy Awards in style on giant screens, with food and drinks by manna, a Red Carpet paparazzi gauntlet hosted by Style Girl Jess James, a curated Silent Auction, a cash prize Oscar Pool and other fun surprises. Tickets are limited, and can be purchased online at www.cucalorus.org. Dress to the nines and walk the Red Carpet with Cucalorus at the best Oscar Party in town! The Hilton . Manna . PPD . Digieffects . Screen Gems . Jess James . Piedmont . Coca Cola . L & L Tent rentals . Encore Magazine . Greater Wilmington Business Journal .